Growing up can be tough, and sometimes you just need a big sister to help you through it. 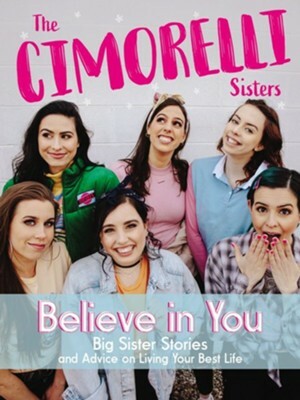 In Believe in You, the six Cimorelli sisters share their experiences and accumulated wisdom on everything from dating and friendship to faith and family. As Christina, Katherine, Lisa, Amy, Lauren and Dani tour the world with their music and read their social media messages, they meet and hear from thousands of girls sharing their hearts. Now, in Be URself, the sisters are connecting with young women who have the same concerns. The teen years may be difficult, confusing, awkward and scary, but it's a lot better when you have someone to go to for advice and some positive, encouraging words. Reading Believe in You is like receiving a big hug and the assurance that you never, ever have to try to change who you genuinely are to be like someone else. You are amazing and unique! Christina Cimorelli is the oldest sister and leader of the six-sister band, Cimorelli. Cimorelli has amassed more than one billion views on YouTube and more than 4.6 million subscribers. Besides music and business, she loves motivating others to grow to their full potential through her music career and her life-coaching business. She grew up in Northern California and now lives in Nashville with her husband. Katherine Cimorelli is the second-oldest sister in the Cimorelli family. She plays the bass in the Cimorelli band and is incredibly grateful for the opportunity to connect with young women all over the world. She deeply loves poetry and writing, and her dream is to write nonfiction books and be a speaker. She also has a passion for nonprofit work and has raised over $40,000 for various charities. She hopes to raise over $1 million for charities throughout her lifetime. Lisa Cimorelli is the third-oldest Cimorelli sister. She loves experimenting with different hair colors and is very passionate about individuality and self-acceptance. Her number one passion is music, but writing has always been a close second. She wants to encourage as many people as she can to let go of fear and try new things. She believes everyone deserves to look in the mirror and love what they see without any changes. She loves her cat, kickboxing, having a nice manicure and the color pink, although her favorite color might be leopard print. She hopes you have a very colorful day! Amy Cimorelli is the fourth-oldest Cimorelli girl. She can be extremely loud and likes to talk as much as she can. She plays guitar and paints in her spare time. She is learning how to be adventurous, which is not a skill she was blessed with. Amy loves friends, texting in all caps, reading, and walking in the rain, and you can usually find her talking on the phone. She hopes to empower anyone who is like her and scared of most things to have some faith, put yourself out there, and enjoy the adventures that come when you say, yes! Lauren Cimorelli is the second-youngest sister in the Cimorelli family. Known as the introvert of the group, she has become a role model for teens across the globe who relate to her reserved nature. Her biggest passions are music and writing. She has been writing songs and playing piano since the age of five and plans to continue making music both with her sisters and on her own in the future. Dani (Danielle) Cimorelli is the youngest Cimorelli, born in 2000. She loves all things creative and active like singing, dancing, longboarding, drawing, writing, playing instruments, and taking pictures. Shes been writing music and poetry since she can remember and plans on writing more books, both with her sisters and on her own, in the future. I'm the author/artist and I want to review Believe in You: Big Sister Stories and Advice on Living Your Best Life - eBook.